The UN Report published earlier this week on the alleged use of chemical weapons in the Ghouta area of Damascus on Aug. 21, 2013 has clarified many issues but left the key questions unanswered: who committed the attack and who are the victims? According to a research made by New Eastern Outlook, the caliber of the missiles suggests that a Soviet-made, BM-14 series 140mm. multiple-rocket launcher was most likely used to shell Eastern Ghouta. This launcher, designed in 1951, was previously part of the Syrian Army’s inventory until it was replaced decades ago by the newer BM-21 (Grad, 122 mm. caliber, designed in 1963) and Chinese-made Type 63 (107 mm. caliber) launchers. However, the old-fashioned BM-14s are widely available in the region and were used, for example, by the Algerian rebels in the 1990s and the Taliban in 2000s. They are very compact and could easily have been secretly brought in to any location on that fatal night, even within the area controlled by government forces. 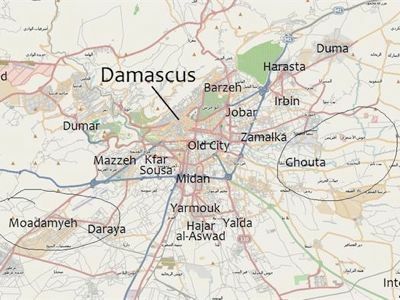 Therefore the presumed location of the launch pad is insignificant, as any deserted suburb of Damascus that lies within range could have been used. Another detail made public was a label found on a warhead. Mikhail Barabanov, an expert with the Russian Centre for the Analysis of Strategies and Technologies commented that this label matches those on missiles produced in 1967 in Novosibirsk (Russia). One might justifiably wonder why the Syrian Army would launch a 46-year-old missile when it holds abundant stockpiles of far more reliable modern weapons. It is also worth noting that the production of chemical weapons in Syria began in the 1990s, when chemical facilities were built near Damascus, in Homs, Hama, and Aleppo. Thus, those missiles, filled with chemical agents, should be dated accordingly or later. If the date of a missile’s production does not match the production date for its chemical agent, it stands to reason that the warhead was filled in an underground laboratory or was even homemade. This is fully in keeping with earlier evidence regarding the use of homemade chemical weapons by rebels in Syria. So despite Washington’s hasty claims that the UN Report points to Syrian government forces as the only potential perpetrator of the chemical attack in Eastern Ghouta on August 21, the actual details of the report seem to prove the opposite: the attack was carried out by the rebels and their mentors in a classic false flag operation designed to lure foreign military forces into an intervention in Syria. Now – as for the victims. Who are they? The report from the International Support Team for Mussalaha (Reconciliation) in Syria (ISTEAMS)  claims that based on eyewitness testimony and video evidence, the affected areas had been largely abandoned by local residents in the days prior to the attack. Yet the footage of the aftermath shows large numbers of very young victims. The report thoroughly analyses almost every relevant video that was posted on YouTube on the day of attack and reveals a number of facts challenging the established version of this tragedy. E.g., why there are so many unidentified children among those affected in those videos? Why there are almost no women? Why do some of the videos show clear signs of sophisticated overlapping? Why, in many instances, are the same individuals shown as both dead and alive? Where are remaining 1,458 corpses other than the eight whose burials have been documented? Mohammad Kamal Chehade (9), Rand Kamal Chehade (11), Nasr Kamal Chehade (7), Nagham Jaoudat Chehade (13), Nathalie Jaoudat Chehade (5), Bachar Jaoudat Chehade (2), Hamza Ahmad Chehade (9), Aamer Ghassan Yahya (8), Haydar Nazem Chehade (12), Zein Nazem Chehade (3), Mehrez Barakat Chehade (13), Bachar Imad El Cheikh Ibrahim (12), Ahmad Imad El Cheikh Ibrahim (13), Jaafar Imad El Cheikh Ibrahim (14), Jaafar Adam Ismael (2), Yazan Haydar Haydar (11), Duaa Wael Mariam (baby), Alaa Wael Mariam (baby), Ahamad Ayman Mariam (baby), Farah Ayman Mariam (baby), Marah Ayman Mariam (baby), Mohammad Ayman Mariam (baby), Dalaa Ayman Mariam (baby), Haydar Fayyad Mariam (baby), Khodor Mazen Traybouche (baby), Dina Mounzer Darwich (baby), Bana Mounzer Darwich (baby), Chame Mounzer Darwich (baby), Ali Barakat Darwich (baby), Abdel Karim Barakat Darwich (baby), Aabir Barakat Darwich (baby), Taym Hani Chkouhi (1), Loukman Bassem Fatime (9), Nibal Bassem Fatime (8), Sylvia Bassem Fatime (6), Ghaydak Wafik Ibrahim (10), Mokdad Wafik Ibrahim (14), Aalaa Nazem Selim (baby), Rima Nazem Selim (baby), Racha Nazem Selim (baby), Limar Ramez Selim (baby), Salem Ramez Selim (baby), Chamess Ramez Selim (baby), Sali Ramez Selim (baby), Tim Aazab Selim (baby), Batoul Samir Selim (14), Lougein Talal Selim (15), Wajad Talal Selim (baby), Jawa Talal Selim (baby), Hanine Talal Selim (baby), Rima Talal Selim (baby), Houssein Ayman Ibrahim (3), Zahraa Ayman Ibrahim (8), Mariam Ayman Ibrahim (5), Batoul Ghassan El Koussaybe (15), Wakar Ghassan El Koussaybe (14), Sandass Ghassan El Koussaybe (13), Zeina Adnan Fatima (6), Houssein Adnan Fatima (4). In case at least one of them is identified by survived relatives on the video footage from Eastern Ghouta, there should be a sufficient legal ground to include Jabhat al-Nusrah and other rebel groups in Syria into the UN and national Al-Qaeda sanctions lists for further international judicial prosecution. “Report of the investigation into the alleged use of chemical weapons in the Syrian Arab Republic, concerning the incident which occurred in the Ghouta area of Damascus on 21 August 2013”, Voltaire Network, 16 September 2013. “The manipulated videos of the Ghouta ’’massacre’’”, Voltaire Network, 16 September 2013.